Happy Teachers Change The World : A Guide For Integrating Mindfulness In Education - ubiq bookshop: the best place to buy books! 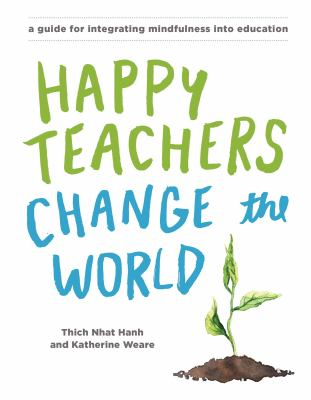 Happy Teachers Change the World is the first official, authoritative manual of the Thich Nhat Hanh/Plum Village approach to mindfulness in education. Spanning the whole range of schools and grade levels, from preschool through higher education, these techniques are grounded in the everyday world of schools, colleges, and universities. Beginning firmly with teachers and all those working with students, including administrators, counselors, and other personnel, the Plum Village approach stresses that educators must first establish their own mindfulness practice since everything they do in the classroom will be based on that foundation. The book includes easy-to-follow, step-by-step techniques perfected by educators to teach themselves and to apply to their work with students and colleagues, along with inspirational stories of the ways in which teachers have made mindfulness practice alive and relevant for themselves and their students across the school and out into the community. Featured in the Almost Summer 2017 Education Newsletter.